Setting up Environmental Projection (EP) isn’t simply applying a mathematical formula. It is an artistic process that requires refinement. The process of implementing EP will take time, financial investment, attention to detail, and a vision for your church visuals and environment. No two rooms are the same, which means there isn’t a one-size-fits-all environmental projection setup. So feel free to make modifications to this setup to fit your room. Some rooms have low ceilings and wide walls while others will be tall and narrow. We’ve seen rooms with fully controlled lighting to rooms with too many windows to count. That being said, it’s important to remember that this process isn’t simply a cut and paste setup for everyone. 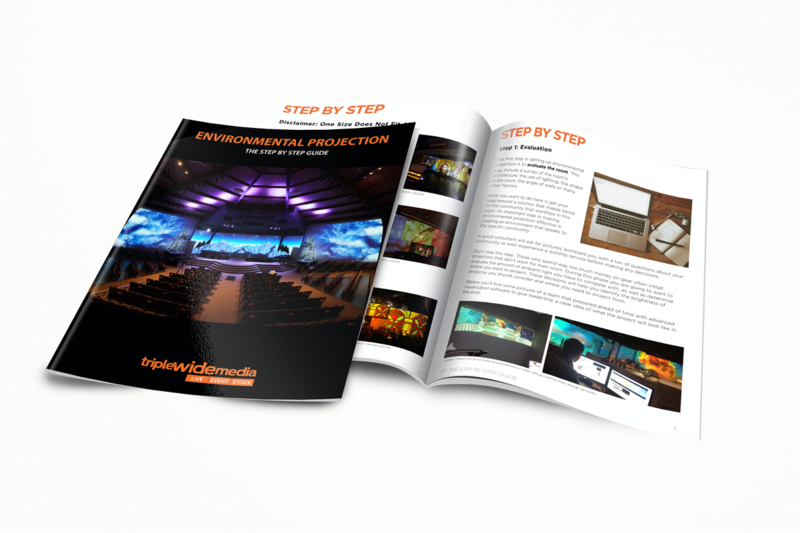 In this step by step guide, we will walk you through the basic process of installing your own environmental projection system. Of course, if you ever need help, don’t hesitate to email our team. To download this FREE resource from TripleWide Media, simply fill out the form below and we’ll email you a link to download this resource. Feel free to share this page (instead of the email you get) to friends or on social media!